Chris is a Senior UX Designer, Coder, Teacher, and Speaker with 10 years of experience, from Paris, France. Professor of UX Design and Cognitive Psychology in many prestigious colleges, he has taught from Associate to MBA Degree level. As a Program Director, and Faculty Advisor, he has played an important role at the Ecole Multimédia, including as Head of the 201 Innovative Lab. In 2013, he has been quoted in 'Project: Responsive', by Rudy Rigot, founder of Holberton School. He relocated to Brooklyn, New York, in 2014. Nominated by Awwwards and quoted by Speckyboy for his outstanding work at Magsty, he was one of the first to code a HTML5 Audio Streaming Live Radio Player. He has spoken at the Paris Web Conference, among Denise Jacobs, Mike Monteiro, and Daniel Glazman. As a CEO, he has launched and led 2 LLCs, one of which was 4 years ahead on the market. More details on Chris' experience can be seen on his interactive resume. 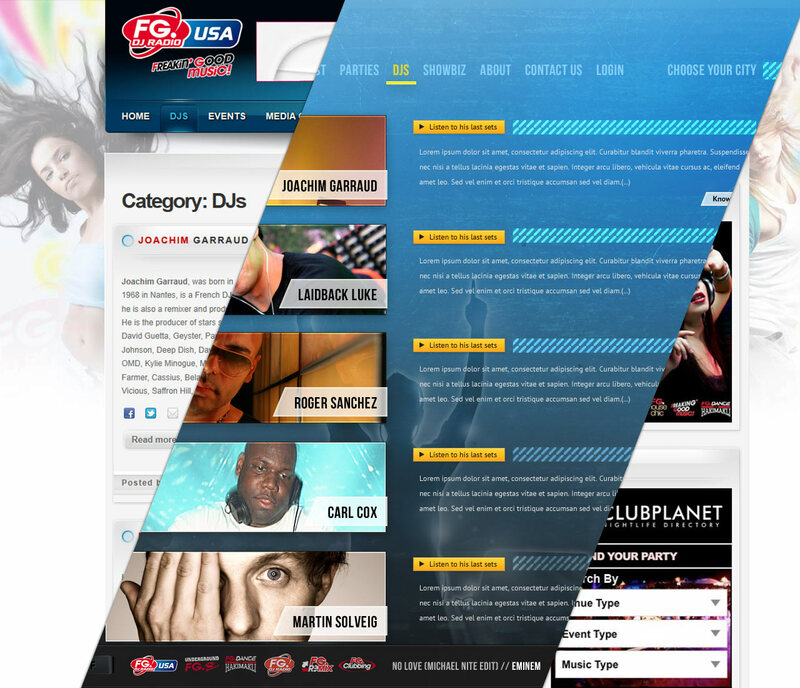 FG USA is the american counterpart of FG DJ France, which was historically the first house radio broadcast in Paris, France. As innovative broadcasters, and efficient party planners, they have also launched international DJs like David Guetta, and Martin Solveig. They needed a redesign of their CMS-designed blog in order to reach out to the US market, and promote their web-based radio. 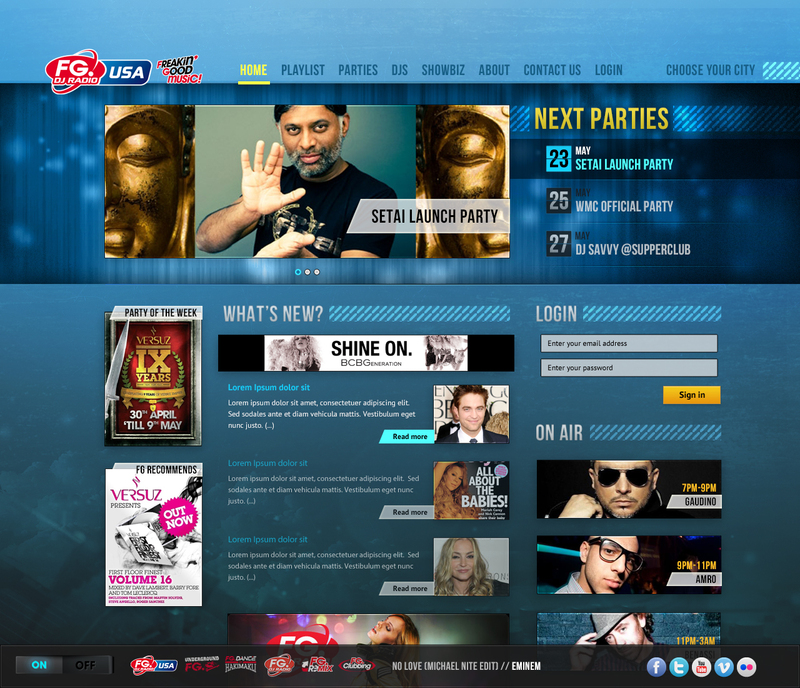 We reorganized the content, amplified the experience around party planning, and improved it with social media strategies. 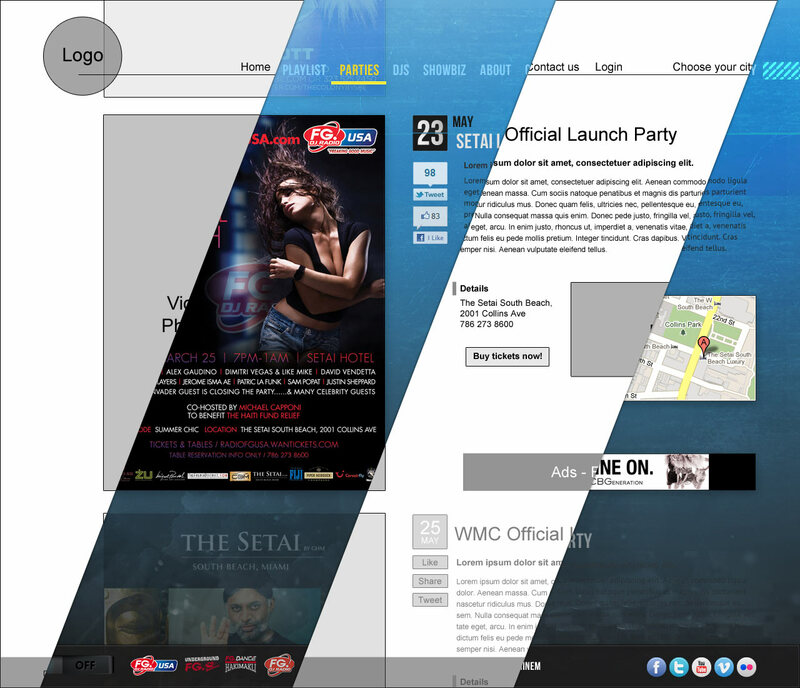 After researching, wireframing, designing, and prototyping, we designed a live, vivid, social party website, and a live radio player, one of the first using the HTML 5 audio API. Psychological research repeatedly demonstrated a link between the provision of choice and increase in intrinsic motivation, perceived control, and task performance. However, usability studies has pointed out that users spend less than 10 seconds on a website. They spend even less time if they don't find a clear and actionable menu, or if too many options are displayed. We used card sorting to restructure the iA and designed a one-window drilldown to help the users focusing on one thing at a time. The more the options there are, the longer the time to make a decision. High numbers of likes on social sharing buttons are often seen as a proof of user engagement. Recent studies suggest that they are more likely acting as a third party validation. 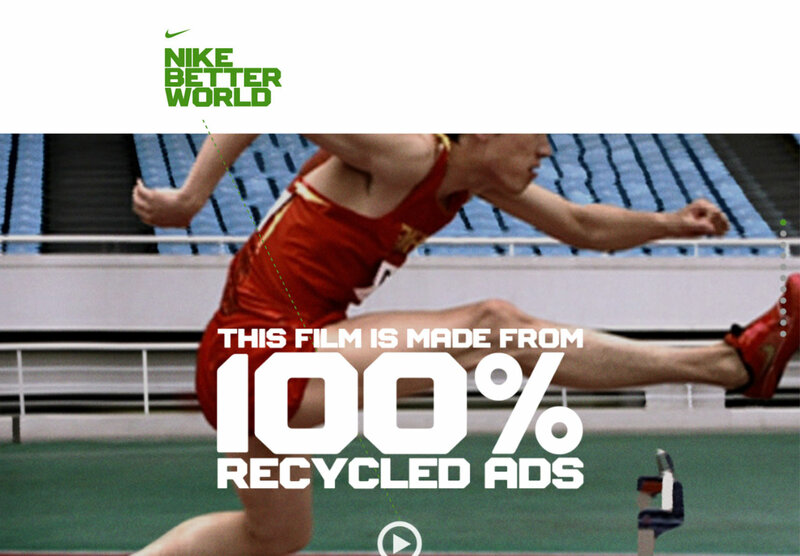 They increase user interest and overall conversion. We proposed a SEO and social media strategy, to gain brand acknowlegement across the US, and engage users. 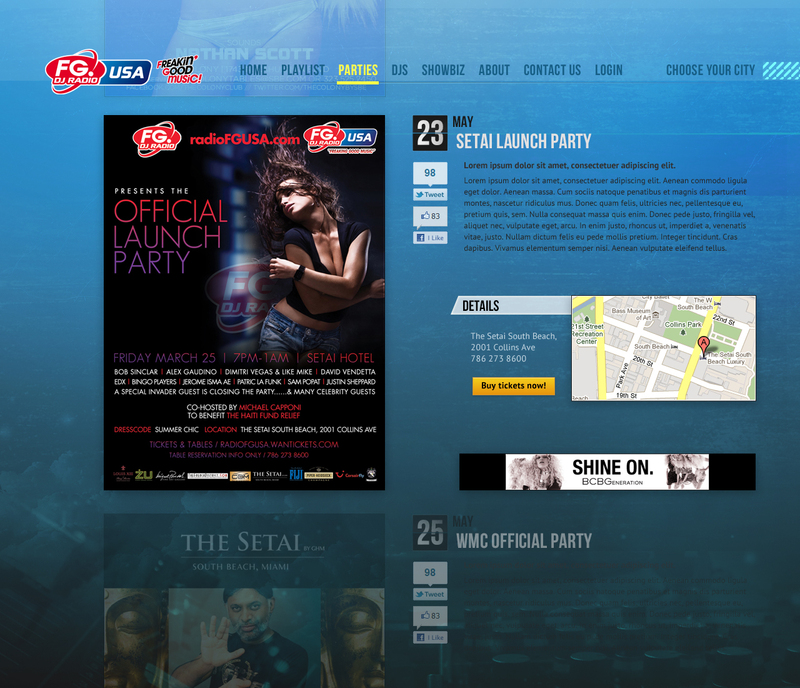 Party bookings increased by 250%, and we gained 10k Twitter followers in only three months. 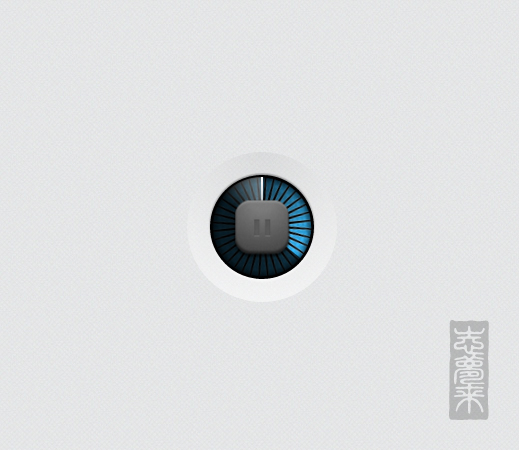 Moovweb "Does Anyone Use Social Sharing Buttons on Mobile?" study. Usability studies demonstrated the impact of limited time offers on e-commerce website. When users think an item would disappear, it triggers an impulsive interest, and results in better engagement and conversion. In order to keep the freshness of hype curated parties, the Events section only displays the next 5 events. Archives, even if existing, are not displayed to the users. 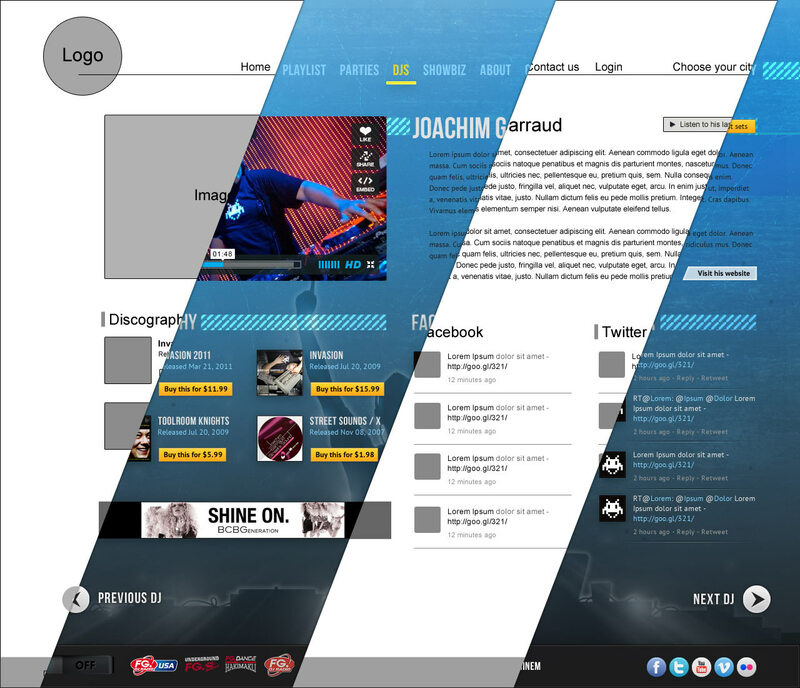 In 2011, 80% of DJ websites are coded in Flash. 40% use a fixed design on only one page. All radio brodcasters are using a CMS, but due to CMS limitations, they usually look alike. 83% of them are displaying News, dates of the upcoming events/shows, and live radio. However, all only offer a Flash-based live radio. 4 only display artist biography. 7 don't share photos or videos about the past events, or media related to an artist. If Facebook, and Twitter are used by all of them, Instagram is the third preferred social platform, followed by Youtube (40%), Soundcloud (30%), Google+ and Spotify (both 20%). 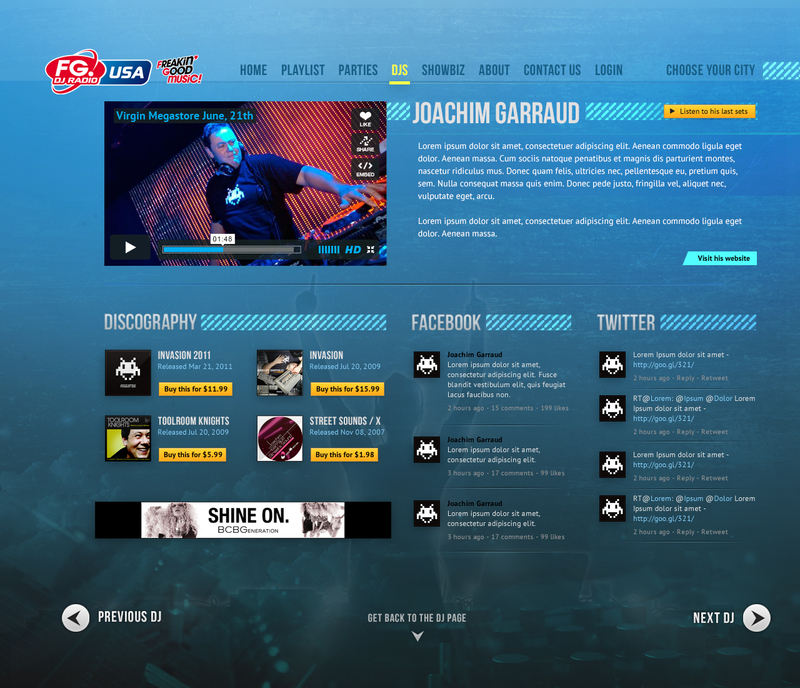 Highlights of the market analysis regarding DJ websites and radio brodcast competitors, such as: Carl Cox, David Guetta, Laidback Luke, Martin Solveig, Joachim Garraud, Sirius XM, Clear Channel Radio, Fun Radio, NRJ Radio, and Goom. Has a pay-the-bill occupation, that requires to stay on his feet all day long, helping customers in the store. He likes to take the pressure off go by hanging out with his coworkers. Browses multiples social sites to find a party to attend to during the weekend. A platform that lists all the good parties in his area, and being able to book easily. 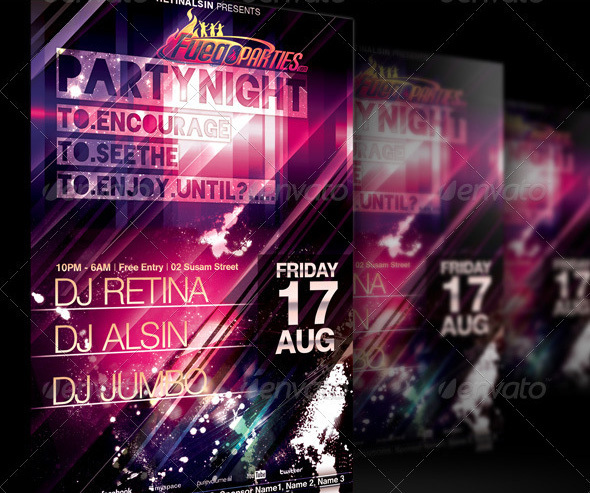 Dude, where is the party I saw on this flyer? Just started a few gigs as a debut DJ. 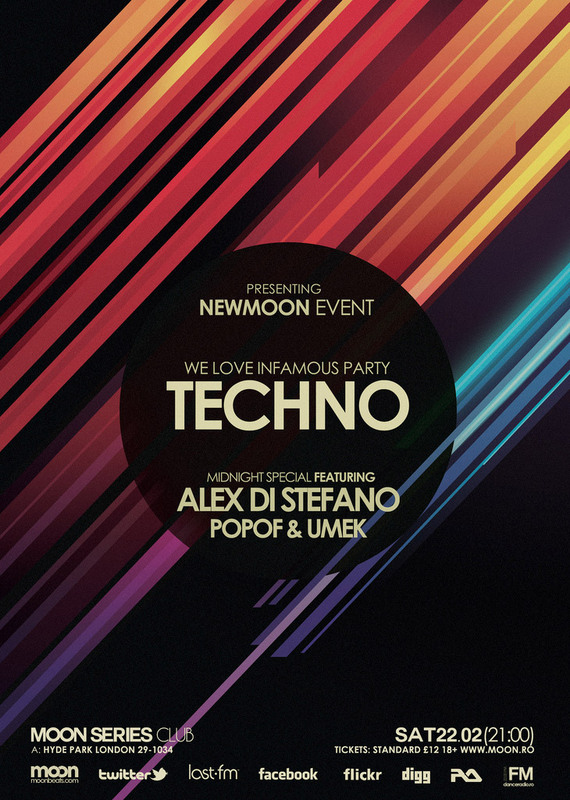 He is eagerly looking to expand his network to make a name for himself in the DJ industry. Browses the web looking for new sets, new sounds, and follows DJs on Soundcloud. Also listens to some online radio. A website to find all the information about the DJ he is following, including sets and where they are going to perform next. 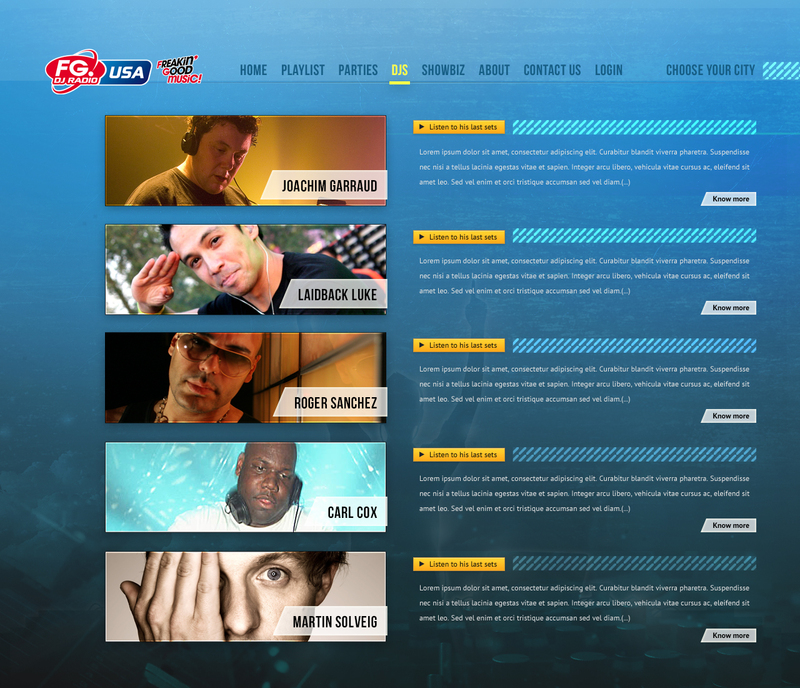 What is the address of this DJ website? Spends her days reviewing and writing about brands on social media. Single, she usually hangs out with her BFFs during the weekend. Always looking for the next party to go, taking selfies, and sharing it with the world. 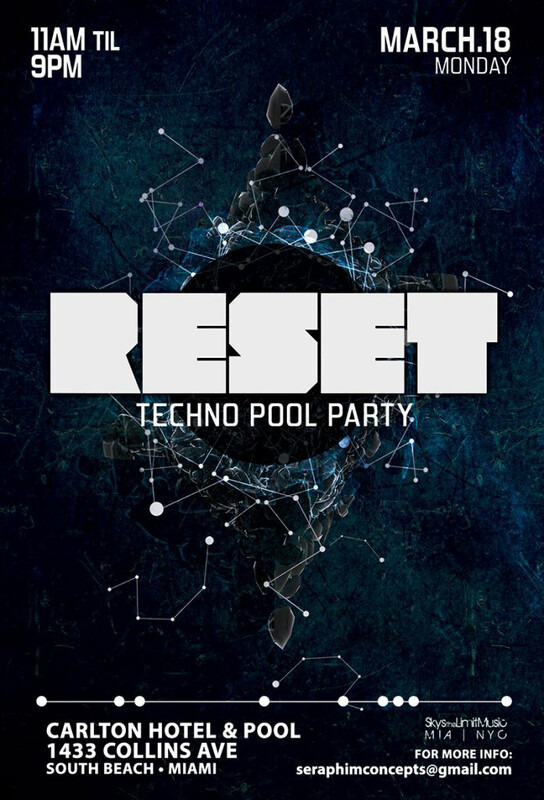 A website that displays next events, previews of the sets, and pictures of the last party. Where are the pictures of us that this photograph shot at the party? 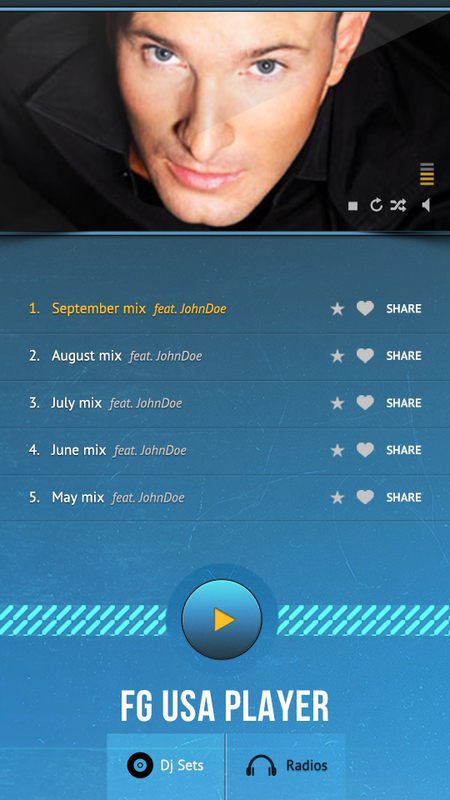 Users have access to the ongoing parties, to the DJ profile, sets, and albums. 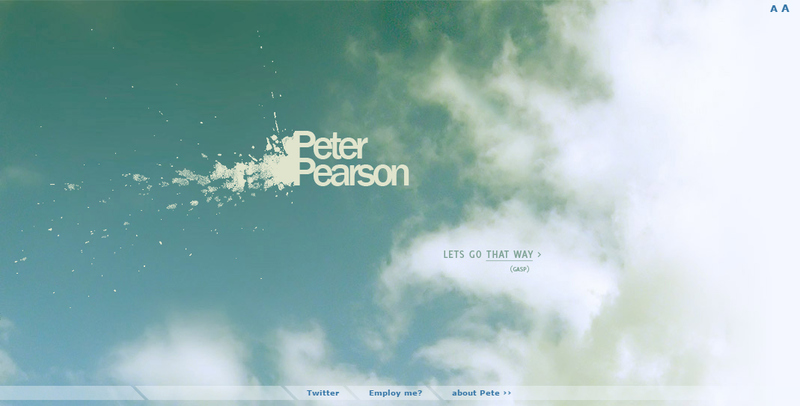 Here are the main pages related to the website. As a 2003 study suggested, a drink feels more refreshing inside a blue glass. Starting from this, and according to the client wishes to appeal to a young adult crowd, we advocated for fresh colors. Thus, an electric cyan, complemented by a bright and vivid yellow, are accenting and contrasting shades of blue, dark blue, white smoke and metal black. FG markets their events as dancefloor experiences across the globe. To support this view and stress on the hype of the events, we suggested using split flap display numbers. It also acts as a reminder of the journey, and of the party captain, as FG shares responsible ethic about not driving drunk. 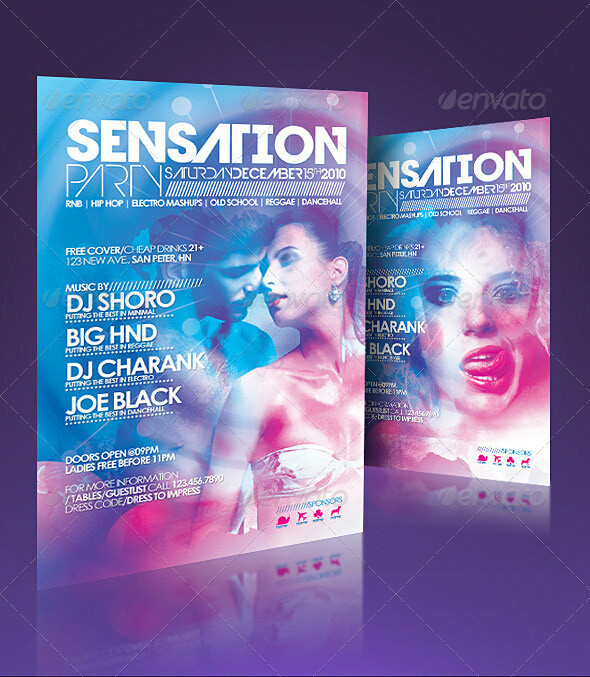 FG USA design is inspired by the compelling art of party flyers: high contrast, flashy colors, grunge background, dynamic shapes, glassy borders, and patterned separators. The cut-edge label shape is a reminder of the silk strip on invitation cards, and acts as a call to action through the entire website. In order to emphasize on the limited time of the events, we used Bebas, condensed sans serif created in 2004 by Ryoichi Tsunekawa, for the headings. Body text is in PT Sans Regular and Bold, a traditional conservative sans serif, characterized by its enhanced legibility. Created in 2009 by ParaType, PT Sans is broadly used in direction and guide signs, schemes, screens of information kiosks and other objects of urban visual communications. 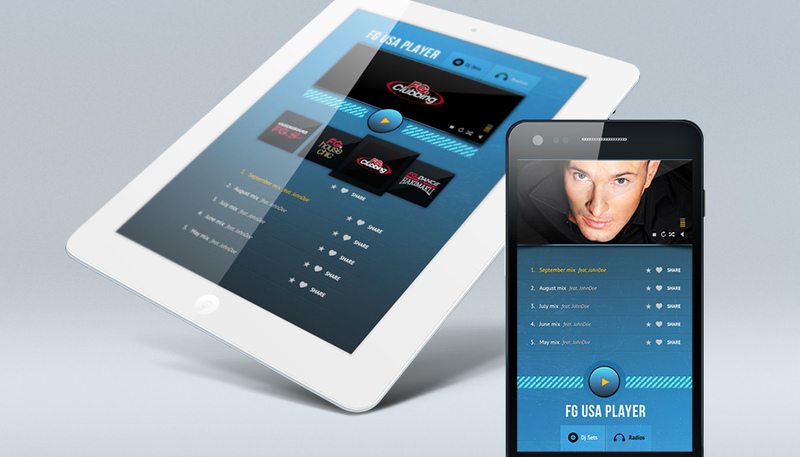 FG USA wanted to be able to broadcast their radios and resident DJs on mobile, without having to deal with approval of app platforms. We strategically advised to take advantage of the brand new HTML 5 Audio API, which was already implemented by major browsers, but not broadly used yet. Chris Drayton integrally coded one of the very 1st live broadcast HTML 5 radio, on par with an XML Parser to retrieve artists information from French servers. In 2016, the very same script is used across all FG websites in France. © 2016 The one who works, all rights reserved. A Theonewho project.